It can feel daunting to spend a lot of money on developers and other costs when you first start a website. You might not know what to expect from the project, are unsure of whether it will work or just feel uncertain about how much money you want to commit to the project. If this describes you then you are in luck because it is possible to start a high quality website for little to nothing. You can use a free CMS such as WordPress to build your website and a free theme to style it. All you have to pay for is a domain name and hosting. It is possible to get both these things for free as well but I highly recommend that you spoil yourself and pay for them. If you do not you might regret it later because it might be very hard or impossible to scale the website as your business grows. A domain does not have to cost more than USD 12 a year and you can find hosting that serves your needs at about USD 5 a month. It is a small investment that gives you a lot higher chance of succeeding. With all this having been said it is time to look at the benefits and drawbacks of using a free theme. By a free theme I am referring to a theme that is available to download for free from the WordPress website or other reliable website. I am not referring to pirated copies of paid themes. These usually contain exploits that allows hackers to take control or add links to your website. Never used pirated themes. This is true regardless of your stand about piracy in general. Themes is the exception that proves the rules. Pirated themes really are full of viruses and malware. The most obvious benefit with free themes is that they are free. They remove the entry barrier to web design. Anyone can built a website and a business around them. All you needs is time and devotion. The developer will usually support the theme and release new versions of the theme when needed. You do not have to think about this as long as you keep the theme up to date. You can try a number of different themes before you decide which one to use. If you use a paid theme or develop your own theme then you have to decide exactly how you want your website to look before you buy/develop the theme. You are usually allowed to modify the theme. You can chose a theme that looks similar to how you want your site to look and then modify the theme until it looks exactly as you want it. A free theme can be a short cut to creating the theme you really want. If you choose a free theme then you can download it and look at the code before you install it. If the code looks good and clean then you can chose to use the theme. If it has poorly written or bloated code and CSS then you can move on to another one having lost nothing but a few minutes. A lot of other websites will use the same theme. Your website will not feel unique and many visitors will have seen the theme in the past on another website. It does not convey the same trust as a custom solution. Lets look at an example. This options website would not look nearly as professional or trustworthy if it used a free theme without the comparison tables instead of the custom theme it uses now. No free theme will be a perfect fit for your websites. Free themes are developed to suit a large number of websites. Not just yours. This means that they might lack features you could use and they might have features you do not use. Free themes often have links to the developer in the footer These links will dilute the link power of your site by sending some of the link power to the developers site. There is also a small risk that the developers site is considered a bad neighborhood by Google and if that is the case then linking to it could hurt your rankings. It can be hard to remove these links. A lot of people use the same theme. If a hacker finds an exploit in one theme then he can use the same exploit on all other websites using the same theme. Using a free theme will in other words make your website less secure. A website that uses a custom solution always look a lot more serious than a website that uses a free theme. A free theme can be a good option if you want to start a website on a tight budget. Using a custom developed theme is always the best alternative but it is not always possible to do so. For some smaller projects it might never be justifiable to do so. 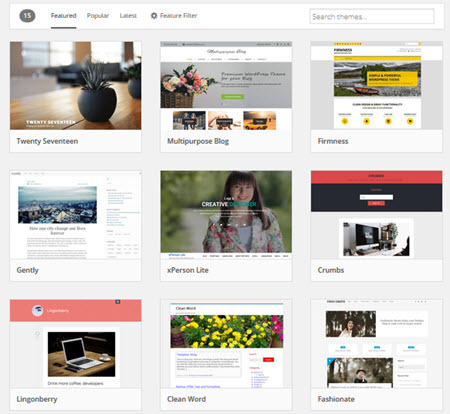 See if you can find a theme that looks like you want your website to look. If you can find it then you should never be afraid to use it. You can modify it over time to look exactly as you want it to and it is possible to start out with a free theme and edited step by step until you end up with a custom website. This can be a very good option for some one who starts their first website. If everything goes well you can edited as need dictates. If the website fails then you minimized your loses.